Ola al-Qaradawy and her husband Hossam Khalaf have been arrested on unfound charges and held in poor prison conditions. Although Hossam Khalaf has been transferred to a collective cell, Ola al-Qaradawy has been in solitary confinement since her arrest. 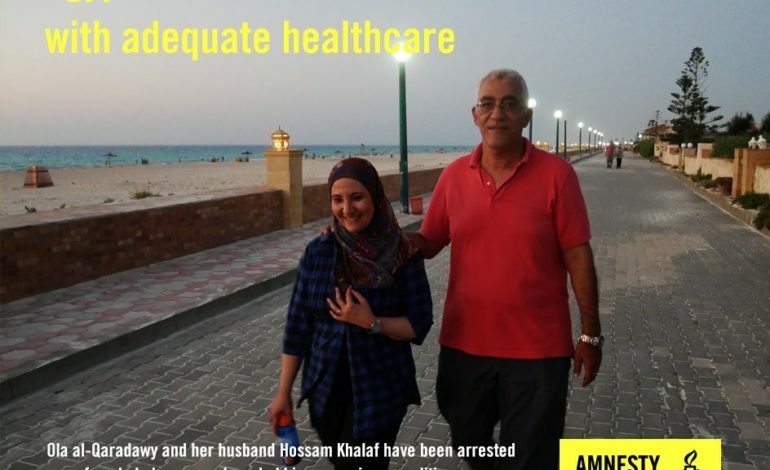 Their health is critically deteriorating and Hossam Khalaf has been denied access to healthcare. authorities have denied both of them visits from lawyers or their relatives. Since her arrest, Ola al-Qaradawy has been held in Al-Qanater Women Prison in Qalyubia governorate in a small solitary cell of about 160 cm by 180 cm in size, without a bed, toilet and without sufficient ventilation and lighting. She is only allowed to use an external toilet for five minutes every morning. Ola al-Qaradawy finds herself compelled to reduce her food intake to avoid the need to go to the toilet. Lawyers, who saw Ola al-Qaradawy on 5 November in the office of the Supreme State Security Prosecution, told Amnesty International that she went on a hunger strike for the first four days of November protesting against her detention and poor prison conditions. Hossam Khalaf has been moved from solitary confinement to a collective cell. He is being held at Tora Maximum Security Prison 2 in Cairo, the capital of Egypt. However, he has been suffering from pain in his eyes ever since his detention, and prison authorities continue to reject his request to undergo medical checks whether in the prison hospital or at his own expense in an external hospital. determination that is reasonable and necessary, specified in law and without vague and expansive standards.